A Canadian aeroplane flight instructor (left) and her student, next to a Cessna 172 with which they have just completed a lesson. Ground School primarily given as a classroom lecture or lesson by a flight instructor where aeronautical theory is learned in preparation for the student's written, oral, and flight pilot certification/licensing examinations. Although there are various types of aircraft, many of the principles of piloting them have common techniques, especially those aircraft which are heavier-than-air types. Flight schools commonly rent aircraft to students and licensed pilots at an hourly rate. Typically the hourly rate is determined by the aircraft's Hobbs meter or Tach timer therefore the costumer is only charged while the aircraft engine is running. Flight instructors can also be scheduled with or without an aircraft for pilot proficiency and recurring training. The oldest flight training school still in existence is the Royal Air Force's (RAF's) Central Flying School formed in May 1912 at Upavon, United Kingdom. The oldest civil flight school still active in the world is based in Germany at the Wasserkuppe. It was founded as "Mertens Fliegerschule" and is currently named, "Fliegerschule Wasserkuppe". A type conversion, commonly known throughout Australia and Europe as an endorsement, or in the United States as a "type rating", is the process undertaken by a pilot to update their license to allow them to fly a different type of aircraft. ^ "Handbooks & Manuals". faa.gov. Retrieved 6 February 2016. ^ Culnane, Michael J., Instructor Rating Ground School Course, Accelerated Aviation Training, December 2001, page iii. ^ "How it all Works: Learning to Fly". www.aopa.org. 2016-02-04. Retrieved 2018-07-01. ^ "Here's What to Know About Aircraft Rentals and Wet vs. Dry Rates". The Balance Careers. Retrieved 2018-07-01. ^ "Royal flying corps: Central Flying school". Flight Archive. Flight global. 1912-04-20. Retrieved 2012-06-23. ^ Jenrich, Joachim (2007). Die Wasserkuppe – Ein Berg mit Geschichte [The water dome – A mountain with history] (in German). Fulda, DE: Parzeller. ISBN 978-3-7900-0389-5. ^ Federal Air Regulation (61.31), US: GPO . Accelerated Flight Training from Flying Mag. 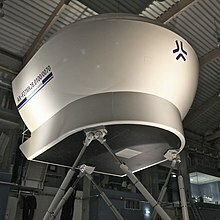 Pilot Training Compass: Back to the Future from European Cockpit Association. This page was last edited on 25 March 2019, at 23:35 (UTC).